At their January meeting, the DSA National Political Committee discussed the Refoundation proposals outlined in their document “Towards an Independent Socialist Strategy for DSA Electoral Work.” The Movement for a People’s Party publicly supported these proposals and asked Socialist Alternative to do so as well. This article is our response. From the successful West Virginia teachers’ strike to the hundreds of thousands of young people taking action against gun violence, social movements are re-emerging after a lull in struggle and protest. Inspired by the 2016 Bernie Sanders campaign and increasingly questioning the capitalist system that offers them no secure future, millions of youth are again becoming interested in socialist ideas. Perhaps more importantly, thousands of them have joined a socialist organization. The 2018 elections are an opportunity to give political expression to social movements and socialist ideas, expose the timid big business nature of the Democratic Party leadership and build the left. While Socialist Alternative and other left groups have grown since Trump’s election, by far the biggest gains in membership have been by the Democratic Socialists of America (DSA) who now have over 35,000 members nationally. As the midterm elections approach, there is excitement about electing more socialists to office and indeed there is a big opening for anti-capitalist ideas. But what sort of election campaigns will step into this political opening, with what political programs, and through which political party? At present, the dominant view in DSA is a pragmatic one – if you want to get socialists elected, the easiest way to do it is to run them as Democrats. In 2013, I was elected in Seattle, and re-elected again in 2015, both times with “Socialist Alternative” next to my name on the ballot. With just a single socialist vote on the city council, we have been able to set the agenda on many issues: spearheading the passage of the first $15 an hour minimum wage in a major city, taxing the rich to build affordable housing, and a series of victories on renters rights. Many of the successes in Seattle helped give confidence to growing movements across the country, particularly with the $15 an hour minimum wage. From the outset, we were told that we should not run independently and that we should play down our socialist ideas. But we didn’t win victories for working people by building electoral coalitions with establishment Democrats, through pragmatic negotiations with other councilmembers, or by compromising our principles. Socialist Alternative also played a central role in winning the $15 minimum wage in Minneapolis although we have never held elected office in the city. Starting with Socialist Alternative candidate Ty Moore’s city council race in 2013, which campaigned on $15 but narrowly lost, we waged a three-year-long fight on the issue and built mass movements, culminating in Minneapolis becoming the first Midwestern city to pass a $15 minimum wage. Building on this victory, Socialist Alternative member Ginger Jentzen ran a powerful campaign for City Council in Minneapolis last year. While Ginger was narrowly defeated electorally, the movement-building aspects of the campaign were a huge success. Before this election, rent control, affordable housing and corporate control of city politics were “side issues, but our campaign put them at the center of political discussion and built movements for housing justice while consciously building the socialist movement and gaining important experience. DSA is well-positioned to run at least five to ten strong campaigns like this throughout the country this year aiming not just at winning votes but also to popularize socialist ideas and build movements. This could be a step toward running strong independent socialist candidates in most major cities next year and in 2020. The DSA is now a broad organization debating ideas and tactics. There are different groupings and tendencies within it. A potentially significant development has been the launch of the DSA Refoundation Caucus which Socialist Alternative welcomes even if we don’t agree on all issues. Refoundation argues for DSA to adopt a more radical program and run more independent candidates with an approach that can build movements of working people. This is why we support many of Refoundation’s proposals which can help lay the basis for a fighting, new party of the left. Refoundation has the potential to build broader support in DSA because the thousands of new DSA activists breathing life into its branches are not tied to the politics of DSA’s past. While DSA historically has been a fully reformist organization dominated by compromising union officials which consistently supported even the most conservative Democrats, this approach is broadly rejected by their new members. Many of DSA’s new activists are pushing it to take a more boldly socialist and combative approach. Building an effective socialist movement that can help win victories for working people will require a clear analysis of the Democratic Party and what is necessary to stand up against the pressures of elected office. The Democratic Party is controlled by the most powerful corporate interests in the world. Democratic leaders would rather see the system stabilized than risk losing control of social struggles by helping build a real mass resistance to the rotten Trump regime. The Democratic Party leadership instead tells activists to “wait until November” and put all our efforts into getting them elected. We should reject this. Mass action, from protests to civil disobedience to strikes, is the best terrain for working people, the oppressed and youth to win battles for meaningful social change. Our electoral strategy should be connected to helping build movements rather than ignoring or serving as an obstacle to them. The Democratic Party leadership (and even its left) hasn’t mobilized a single mass rally at a time when millions are looking to take action and get organized against Trump. Yet millions of the most progressive workers and youth vote for the Democrats, and Bernie Sanders has brought new forces and sparked sharp debates in the previously decaying left wing in the party. Many in DSA feel that using the Democratic Party ballot line is not incompatible with running a bold campaign or using elected office to win real gains for working people. But the question of party cannot so easily be disconnected from the question of socialist politics and fighting strategies. Both to win endorsement in the Democratic Party and to maintain relations with even the left of the party creates enormous pressure to adapt to a corporate-friendly approach to politics. Securing Democratic endorsement means limiting your political program and making it establishment-friendly from the outset. After election, the demands from Democratic Party leaders only grows to “go along to get along” in order to maintain party support. Resisting these pressures requires building an alternative source of power, as well as an organization with democratic structures to hold representatives accountable. Without this, even those elected calling themselves socialist will rarely be effective at fighting for working people. It is no accident that among those elected officials in the U.S. privately or publicly identifying as socialist, none in recent history have led class struggles to victory in any way comparable to Socialist Alternative in Seattle. Socialists should be sympathetic to those genuinely looking to transform the Democratic Party, but should also warn about the fundamentally pro-capitalist nature of this institution and the political role it plays for the billionaire class. This year, people want to strike a blow at Trump and the Republicans in the midterm election. While socialists understand this sentiment, we need to boldly pose an alternative to ruling-class politics with viable independent socialist campaigns. This should be connected to the call to build a new mass party of working people that can decisively defeat the right-wing agenda. It should not be forgotten that at the beginning of the Obama presidency, the Democrats controlled Congress, but Obama’s largely pro-big business presidency led to disillusionment amongst many of his initial supporters. With no large scale left alternative and Sanders refusing to run independently, Trump was able to partially exploit this hostility to both the Democrat and Republican establishments. Despite the fact that thousands of activists are currently getting involved in the effort to transform the Democrats into a left or “people’s” party, sentiment for independent working-class politics is also growing.Conclusions are drawn by many from the Democrats’ long record. For instance, Gayle McLaughlin, Richmond Progressive Alliance (RPA) candidate is running a left campaign for California’s Lieutenant Governor which Socialist Alternative has endorsed, and we’re excited about their aim to turn RPA into a state-wide organization. 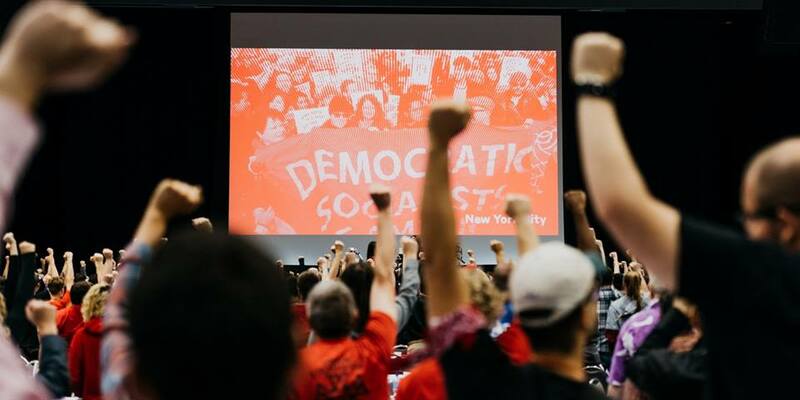 Many debates will emerge within and around DSA in the coming months and years as new socialist activists try to make an impact on the organization’s direction. An important part of these debates will be electoral strategy, and the 2018 elections is an opportunity to clarify these issues. While the resolution from DSA’s National Political Committee in January on electoral strategy has many positive points, it does not concretely explain how socialists can make the biggest possible impact on the 2018 elections to build a movement to end capitalism. Worryingly, the statement points toward the aim to “one day soon, claim hundreds or thousands of elected officials” without sufficiently clarifying what political program or party these officials would be accountable to when they inevitably face the huge pressures of working in pro-capitalist institutions. We agree with the conclusion of the Refoundation Caucus that DSA should run its own viable independent socialist candidates rather than just endorsing the already-existing electoral efforts of left activists. This year, DSA should urgently prepare to run independent, openly socialist candidates with clear demands that forward the interests of working people and connect to the need for a socialist transformation of society. The candidates and offices they’re running for should be carefully chosen with the aim of running viable campaigns that can make a political impact, transform the discussion, build movements and grow the socialist left. This would be a huge step forward rather than just endorsing candidates that don’t effectively build an independent working-class alternative. DSA grew dramatically in 2017 for many reasons. Young people who were active in the Sanders campaign wanted to fight Trump and the billionaire class. DSA, unlike Sanders’ Our Revolution, calls itself socialist, has membership meetings, participatory structures and gets involved in more than just elections. DSA also, unlike other socialist groups, has loose membership requirements, undefined politics on many issues and asks for a low level of commitment. DSA’s looseness and unclear approach to elections wasn’t a barrier to its growth in 2017, but now the DSA is faced with the question of what it does next. Most progressive workers and youth will be focused on defeating the Republicans in 2018, but the Democrats won’t give effective expression to the developing movements due to their pro-capitalist nature and desire to protect the interests of the system. Given this, there will be opportunities in carefully-selected districts to run viable socialist campaigns to give expression to the anger against inequality and right-wing attacks on our living standards. This year, the socialist left will need to prioritize popularizing our ideas through viable campaigns with concrete demands and a movement-building approach. If DSA launched five to ten serious electoral campaigns drawing from the lessons of the most effective independent left efforts – including those of Socialist Alternative and the Richmond Progressive Alliance in California – this would be a huge step forward. Five or more viable independent DSA campaigns in 2018 would help activists gain experience, build the profile of socialist ideas, and counterpose our approach to the corporate hacks in the Democratic Party leadership. Socialist Alternative’s successful electoral campaigns, movement organizing, and union work flows from our understanding of Marxism, our class struggle tactics and strategy, and our recognition of the urgent need to end capitalism internationally and replace it with a socialist society. The recent bitter experience of the SYRIZA government in Greece has once again illustrated that without a clear break with capitalism “left” governments will either fail or end up carrying out the capitalists’ bidding. The working class is the key force that can end capitalism. Socialists must connect the day-to-day struggles of working people with concrete demands to not only improve our conditions now but also to fundamentally transform society. Socialist Alternative calls for taking the top 500 corporations into public ownership to be democratically run by working people in their interests, rather than for the greed of the few. We cannot solve the problems of massive inequality, poverty, and environmental crisis under a dictatorship of Wall Street, because we cannot control what we don’t own. Flowing from this, we see the need for a cohesive group with clear ideas working in solidarity with revolutionary socialists internationally with whom we can share lessons from and develop a common analysis and plan of action. Our electoral successes did not occur because individuals chose to run for office and then we figured out whether or not to “endorse” them. Instead, it came from an assessment of the strength of the movement, the key demands to bring forward, the electoral races where we could make the biggest impact and the personnel and roles needed to best build the socialist movement in the elections. This required a discipline and concentration of resources “at the point of attack” to make the biggest possible impact for socialist ideas. While we see the need for broader more federal organizations and movements and participated in these formations, a cohesive organization with clear ideas like Socialist Alternative is often essential in heated battles with the billionaire class. We also see the need to lay the basis for a broad independent left party in the United States. DSA can play a role in popularizing this in viable 2018 campaigns and by linking up with other forces like RPA in California, Movement for a People’s Party, the People’s Party in Seattle, and Cooperation Jackson in Mississippi. A campaign for a new broad left party should also include an orientation toward left-led unions like nurses, teachers, and transit locals as well as toward Our Revolution, aiming to win them away from the dead-end of the Democratic Party. Socialist Alternative wants to participate in any developing broad left formation and contribute to the debates that would emerge within such a force. Socialist Alternative has worked well with DSA in many struggles across the country despite our differences, from Ginger Jentzen’s campaign in Minneapolis, to the fight against the far right in Boston, to housing struggles in Seattle, and much more. For years the old DSA leadership used the specter of Stalinism to try to discredit genuine socialist ideas, including banning members of “democratic centralist” organizations from joining. We welcome the fact that many DSA branches are considering lifting this ban on members of “democratic centralist” organizations joining DSA. We totally reject bureaucratic, Stalinist, and top-down methods. To achieve a society where there is democratic control and management, the workers’ and left organizations themselves must be democratic – debating and deciding upon issues which are then implemented in a united fashion. We offer our experience, skills and ideas in DSA’s discussions and hope to deepen our collaboration nationwide. We would like to work with the Refoundation Caucus where possible to further the need for bold socialist candidates, independent from the Democratic Party, and to build toward a mass party of working people. DSA running strong independent campaigns in 2018 would be an important step in this direction. The aim would not just be to get people elected, but to raise the political consciousness and level of organization of the working class in its fight for a socialist future.